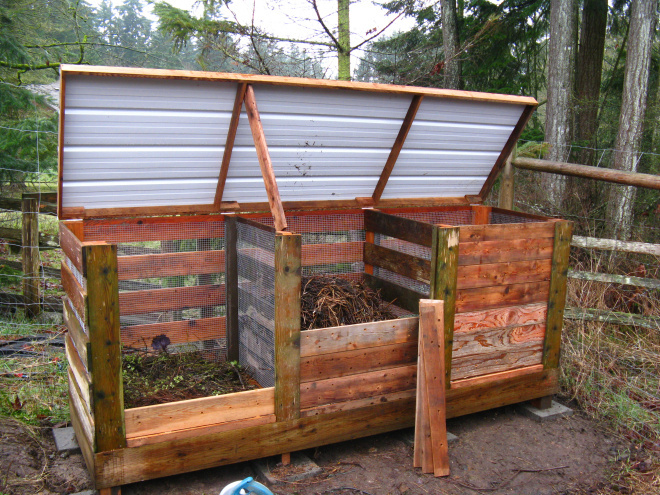 Every serious and not no serious gardener should make room for either an open compost pile or enclosed contained composter in their backyard, patio, or balcony. 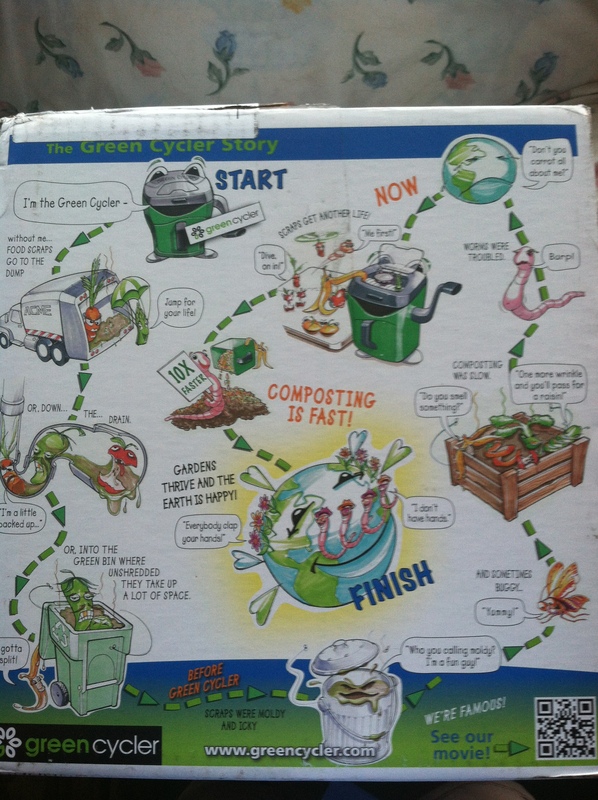 Composting is a sustainable and environmental method way of gardening that is becoming more of a lifestyle choice. I keep a green enclosed plastic container with a charcoal filter on top, underneath my sink. When I have food garbage, it gets thrown in there, and later is taken up to my larger compost pile outside. Once in my outdoor compost pile, the food matter gets turned regularly, covered with soil, and mixed with green material from my garden to break down into “black gold”. 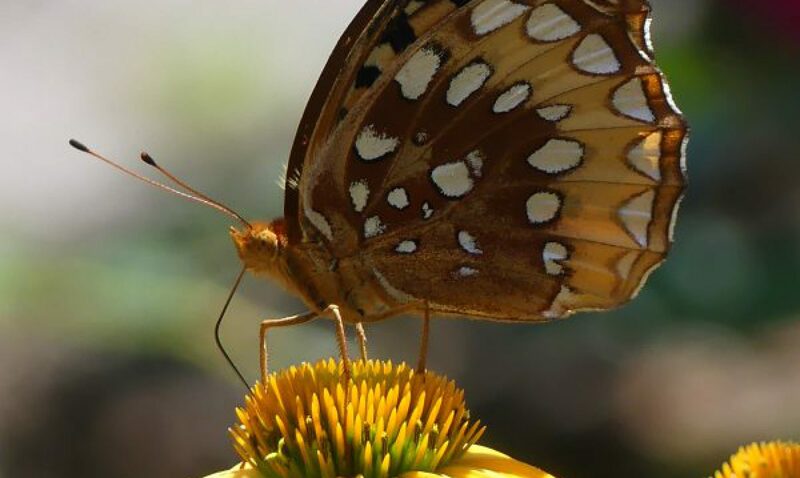 Living decomposers, such as millipedes, slugs, fungi, and other insect and animals dig, chew, and digest the organic matter, pass it through their bodies to break it down into a soil-like crumbly dark chocolate-brown substance. This compost is like vitamins for your soil, providing nutrients that are necessary for healthy plants to grow. Enclosed in snow fencing, I am lucky to have lots of room to spread out my compost pile. Measuring about 10 feet in diameter, it is roomy enough for me to actually roll a wheelbarrow into and dump it, making it very convenient. I can turn over the debris standing within the snow fence, and fling some soil on top to keep down the odor. Not everyone has the room for an outdoor compost lasagna concoction, so companies are coming out with countertop machines that break down the material, “pre-composting”. By breaking vegetable matter down into smaller pieces, it speeds up the process and becomes more manageable for apartment and small property owners. 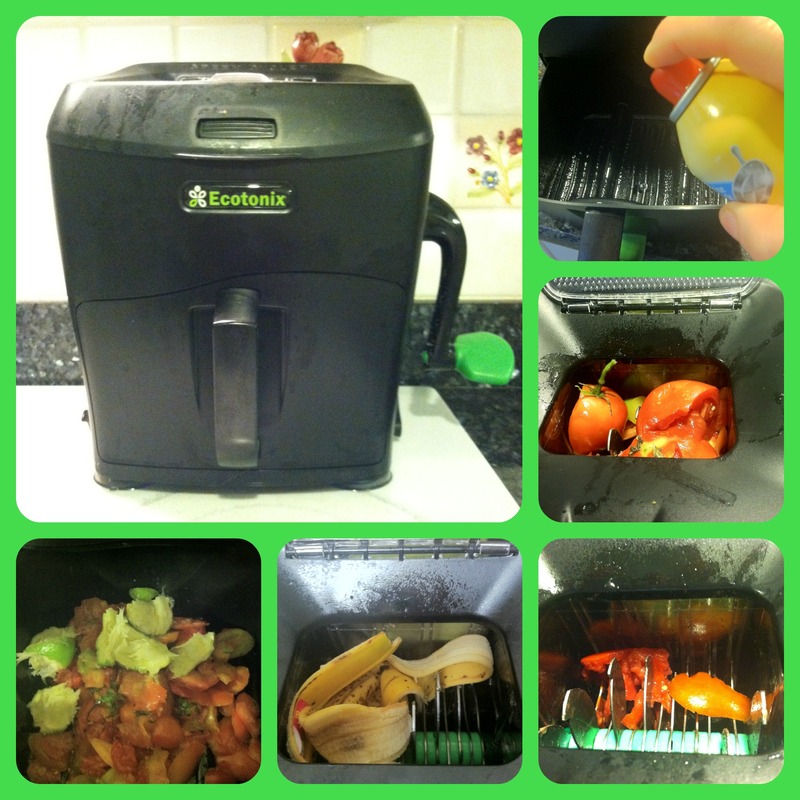 I tried one of these machines from Ecotonix called the Green Cycler, and set it on my kitchen countertop to take care of my vegetable waste. The Green Cycler attaches to your counter with large suction cups, which stabilizes the unit while you crank the handle to shred. 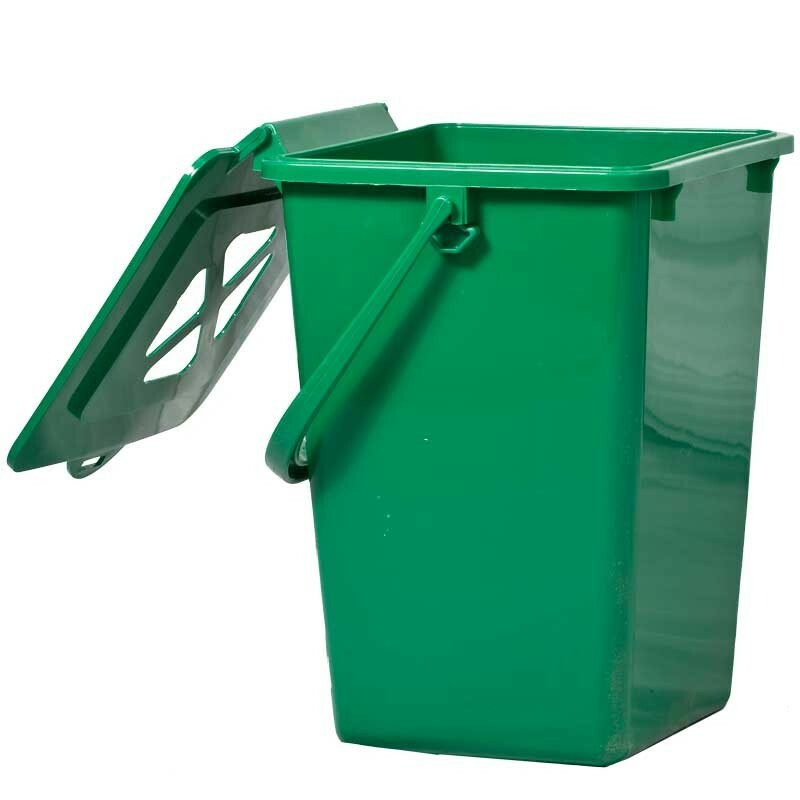 According to the Ecotonix literature, the Green Cycler was developed to “vastly improve food scrap recycling”, and “for kitchen-friendly performance, ease of use and fast clean-up”. It certainly was easy to use, and there is a “ZeoFilter” made from 100% natural, toxin-absorbing zeolite to filter out any odors, and can be recharged over and over. 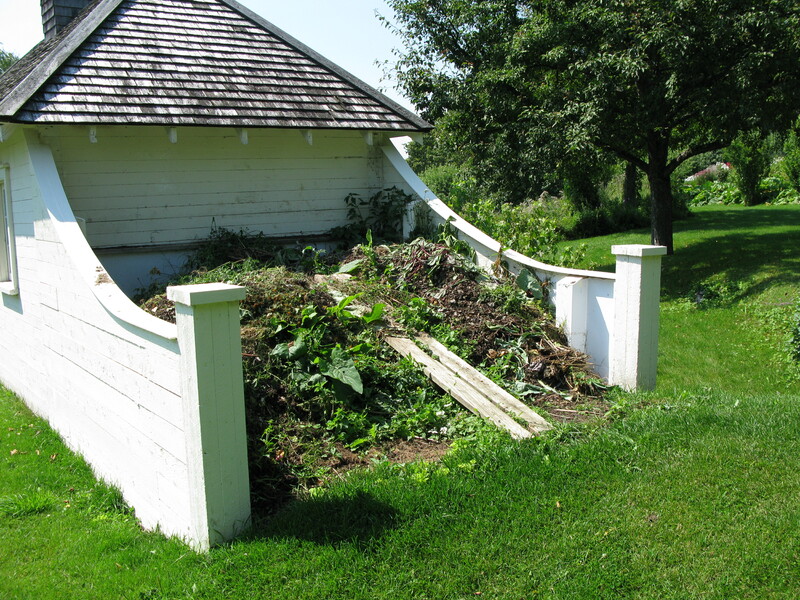 If you don’t have room for a large compost pile, you could take the ground up vegetable matter or “pre-composted” debris and bury it in your garden to break down quickly to nourish the soil. The Green Cycler stores food scraps in a bottom drawer without smell, mess, or hassle. You simply place the food scraps in the top hopper and use forward and backward grinding action with the crank on the side. The stainless steel shredders will grind through most anything except for peach pits, corn cobs or other stringy matter. By spraying a little Pam on the shredders, the stainless steel cuts through the vegetable matter smoothly. My only complaint is that the machine takes up some valuable real estate on my kitchen counter. You can see more about this machine at www.thegreencycler.com. What Can I Put in My Compost Pile?? 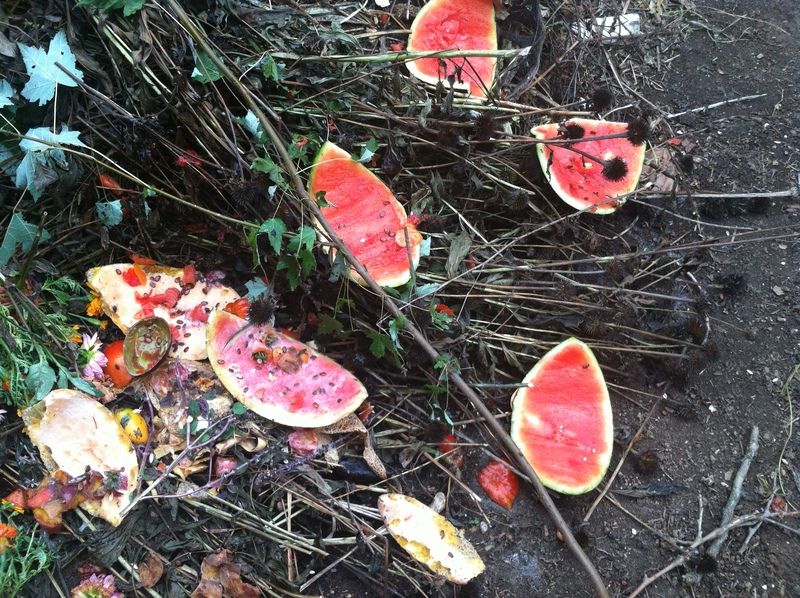 Place only vegetable food scraps in your compost, not animal products, as these could attract rats or other animals. Think vegetarian! Anything that has a mother, don’t discard in your compost pile. I also dump debris and cut-backs from my garden into the compost, as well as grass clippings and anything vaguely vegetable in origin. Chopping things up into smaller pieces speeds up decomposition greatly. Serious composters add materials to speed up the cooking process like manures, but I don’t have ready access to these. I mix up the layers and add soil to hasten decomposition, but if I don’t have time, it will sit and take a little longer to break down. 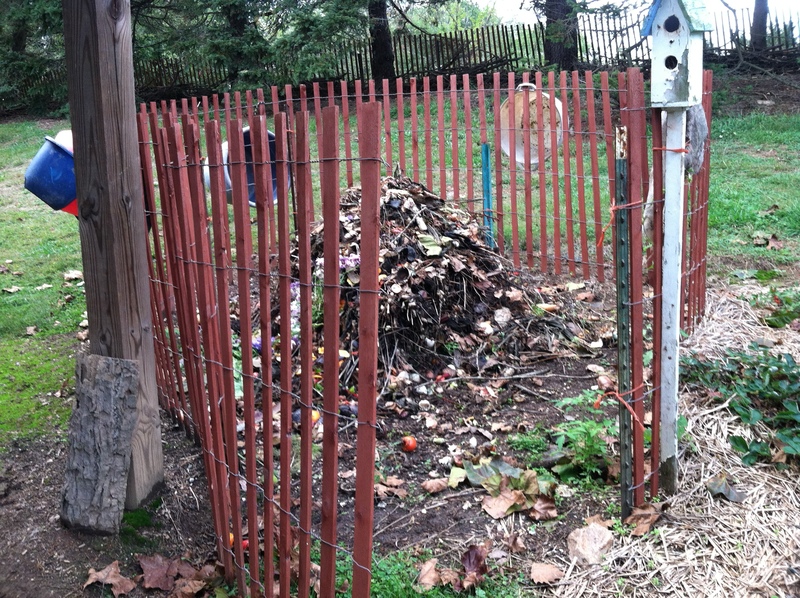 The pile will eventually rot and turn to compost, but can take longer. Treated lumber as it contains levels of copper used in preservation. 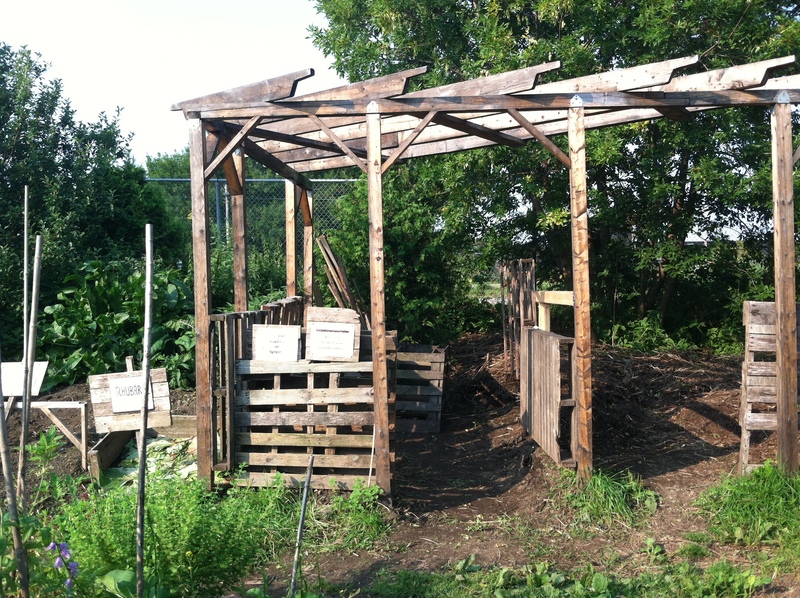 Also, if you construct a compost bin, do not use treated lumber for the same reason. Old treated lumber prior to 2003 included levels of copper arsenate, so you certainly don’t want to use this either. To construct a wooden compost pile, use lumber that is rot resistant, such as cedar, juniper, locust, ironwood, or white oak. 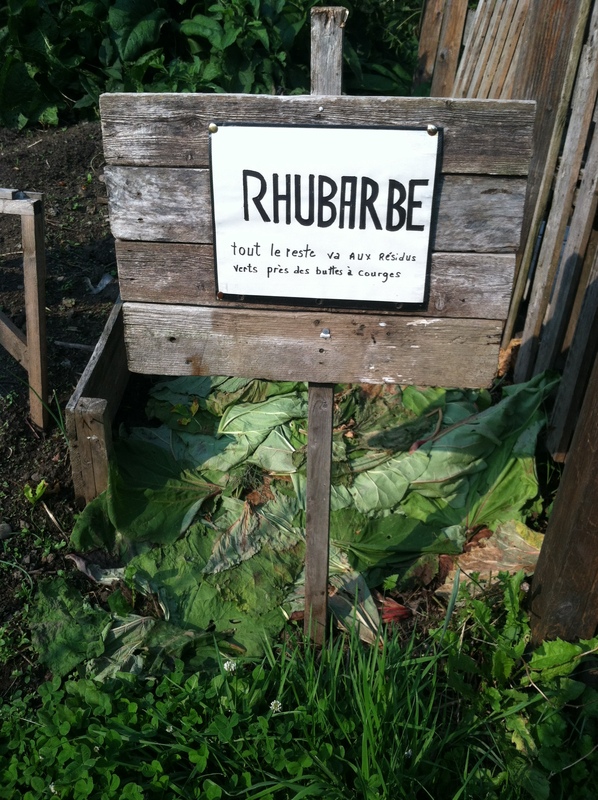 Rhubarb leaves which are poisonous and contain high levels of oxalic acid; the sign above indicates to separate poisonous Rhubarb leaves from other green matter. Some information that I have read on this subject is confusing and says that the composting process will eliminate residues and it would be safe to use. I like to err on the side of caution and don’t add Rhubarb leaves. Three bin composters are efficient composters because you shift the material along to the next bin as it starts to break down. 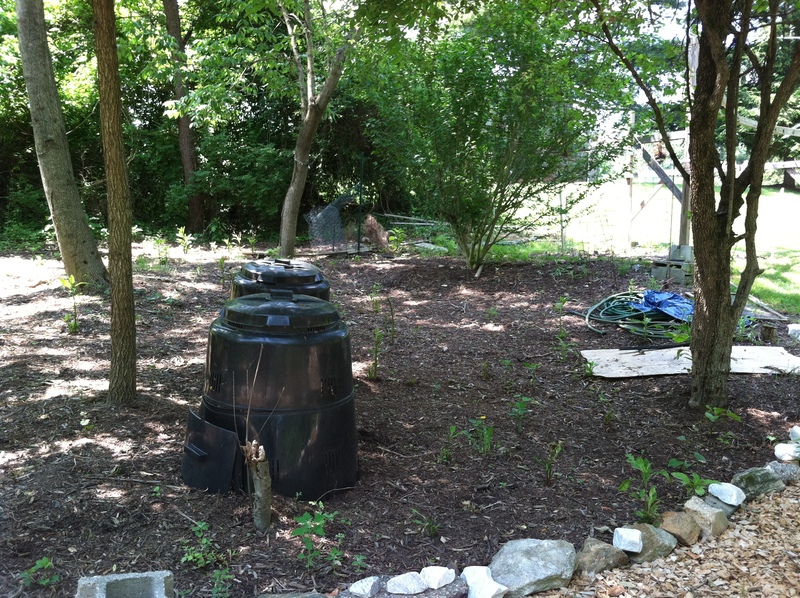 Air circulation is essential for fast composting and the slatted sides of this type of composter helps air penetration to the debris and speeds up the process. I used to have this type but found that it required more time than I wanted to spend, and changed to a one bin system. I’m a huge believer in composting, too. When used as a top dressing for plants, I rarely have weeds. I even compost old socks, worn out dish towels, and sewing scraps. I have found the large black composting barrels work well and decompose things faster than my piles did. Wow, I never thought about fabric! But you are absolutely right that anything like that would break down. Wonderful examples! I see it as a civic responsibility to decrease my landfill waste by composting all vegetable refuse! Yes, some communities are going to require that you compost your scraps in the near future. I used my Vitamix to blend my green waste to liquid and poured it on the compost for liquid. It will even do banana peels that I fed to my rose bushes. No extra machine on the counter that way. Yes, since I don’t keep chickens, I forgot about this method. But my friends who have them, constantly remind me about this useful job that they do! I’ve never heard that about rhubarb leaves. I wonder if the same is true for castor bean plants – I always compost these, and we’re still alive, so I guess it’s ok. LOL! I compost my castor bean plants too. Never thought much about it either.